I love this city. I first visited with my parents when I was eleven. Its museums (Hermitage, Russian Art, St. Isaac Cathedral, Navy, Zoology), theaters, stunningly beautiful architecture all had a huge impact on me even at this age. Later I visited Leningrad many more times. I spent 5 years there as a student of the Leningrad Institute of Technology – probably best years of my life. Then I visited this city every year to see my friends, for conferences and symposiums in Physics, and business with my colleagues from different research labs. Even after I emigrated, I have an obligation to come to Leningrad (now Saint Petersburg) when I travel to Russia for a river trip. 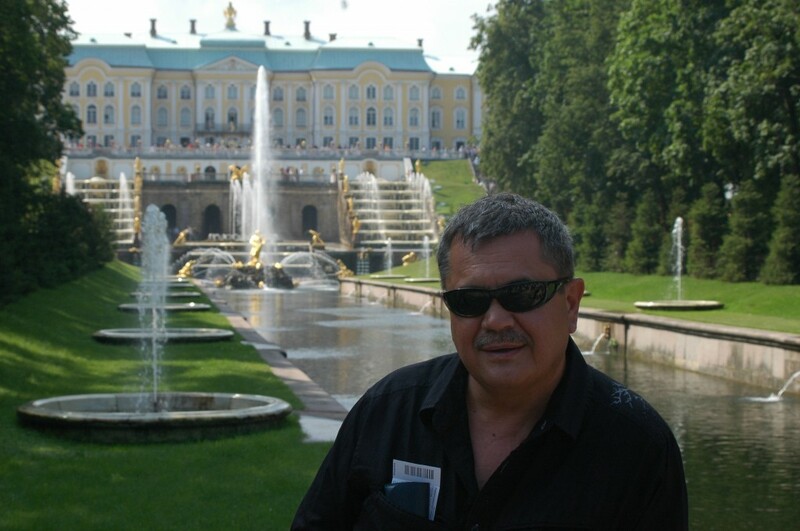 This time I came to Russia one week prior to meeting our Kaa-Khem guests. I spent one day in airless, overcrowded Moscow with my high school classmates and left for St. Petersburg on a night train. I have to say that Russia has made significant progress in this area. The railcar was new, very clean, and quiet – despite that it was just a standard car for regular Russian citizens. But it was funny to meet in my compartment a college student from Mexico City, and a Russian (but English speaking) car salesman. We had a great time (even without traditional Russia vodka). The train arrived at the St. Petersburg rail station, which is an architectural copy of the station I left from in Moscow, but felt like a very different world. Peter the Great built St. Petersburg as a “window” to Europe and without a doubts it is the most European in Russia. My college friend Sasha met me at the station and drove to his apartment in Kupchino – the area began as a suburb 40 years ago but now you probably may call it a mid-town. It was nice to see how much cleaner the city was since my last visit 6 years ago. Of course in many ways it was only about the façades, as I only remember grey, smoky buildings from the Soviet era in this area. After a short rest Sasha took me to Petergof – the area outside the city where a unique park complex of palaces and fountains is located. For both of us, it was the place where we spent a lot of time walking with our girlfriends (one of them became Sasha’s wife) on “white nights” among the fountains, which looked very strange without people. I remember that in the 60s, the palaces were still in ruins after the German invasion during WWII. But ironically, security was not tight like it is now, and we could easily enter the park at night with our dates (of course not through the official entrance). 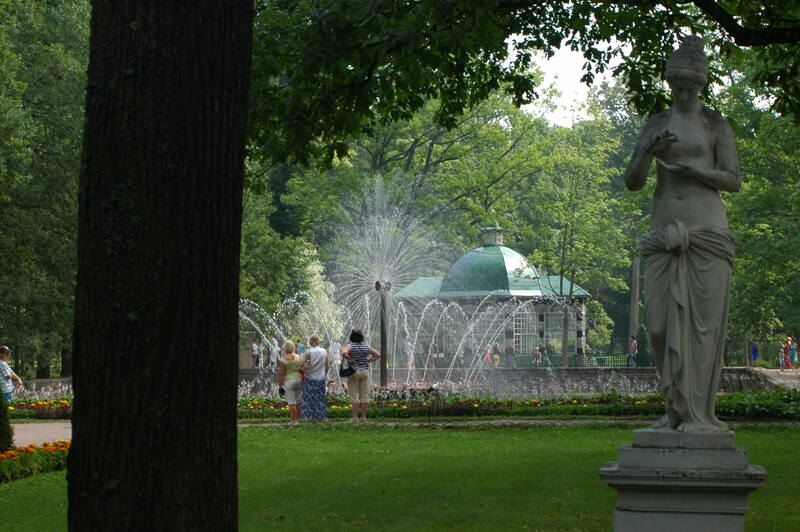 Today the park is completely restored and crowds of tourists flood the palaces and walkways of the park. If you are a foreigner, you must pay for a ticket, but Sasha used his Russian passport to get tickets for about 20% what I would pay with my American passport. Believe me – you won’t be sorry that you paid for your tickets. 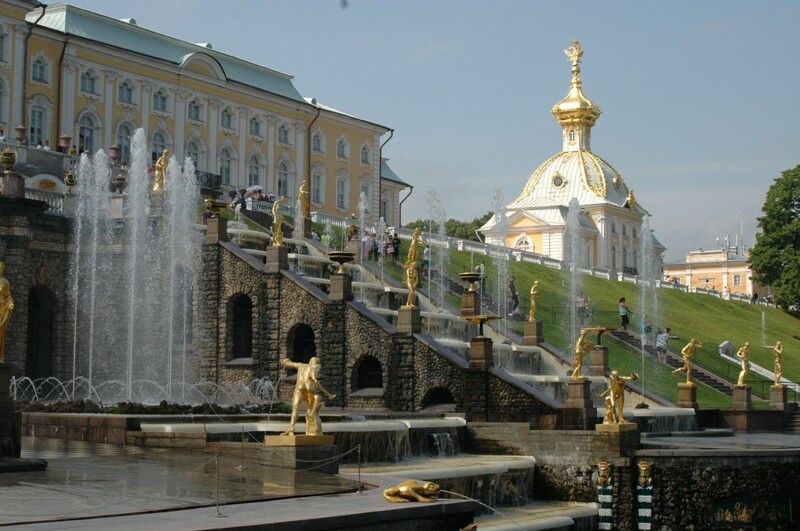 You will never see anything like this anywhere else – Russian Tsars had good taste for luxury. There are many options to reach the park: you may take a train, drive a car along an excellent road among Putin’s palaces, or take a boat from the center of St.Peterburg. We came back to the city and met at one of the metro stations (probably the deepest in the world) with our college friends. We sat outside of a small café near the Russian Art museum, drank some beer (it is not bad at all now), talked about life, friends and recalled some stories from our college life. Then we walked to the Neva River. It was late, certainly well after 10 pm, and low sun threw that magical light to the beautiful buildings and reflections on the river and canals. Like many years ago we slowly walked along the river and streets and enjoyed seeing each other. I drug my feet behind my friends and felt something special about this city. I do not know what it was: air, light, spirit of the city – but it was very special. Probably I looked like a happy puppy. You have to walk Leningrad late in the evening and maybe you will experience the same feeling. The next morning another of my classmates came to see us. Sergey spent 25 years working and doing research in Chernobyl. It was very interesting to listen to him and Sasha, who also worked there for awhile. Their professional view on the accident and the situation there were much more measured and less sensational then one may read in the media. Then we went to see our college – Institute of Technology. It was almost empty – summertime – and we could not get to our departments. It was sad to see the degradation of what was once a great school. We looked at old desks that were probably there 50 years ago and dilapidated warehouses and lab buildings inside the main yard. It seemed that the Russian education system went downhill in post-Soviet era. We continued our walk, visited some cathedrals that were in pretty bad shape since the Soviet time and tried to find Shashlychnaya (Kebab house) near Nikol’skiy Cathedral that was our favorite 40+ years ago. People on the streets looked different than before: they looked less suppressed, smile more, are better dressed, more stylish and accepting of the behavior of the outside world. I remember how old Russians objected to the normal style of behavior of my German rafting friends, whom I once brought to Leningrad. There are no such things now. Still Russians are very stubborn in their vision of the world and their own country. I argued with my friends trying to show them the disadvantages of the Russian model of democracy in comparison with the Western model, but with no success. Despite this we are and will be friends even though we live in different worlds. That evening Sasha threw a party for us at his house. It was so nice to see the guys seating without shirts (there is no AC in majority of Leningrad apartments) around a little table with a big bottle of vodka and simple, but tasty food we had all made. We drank to all of us, our friends who already passed away, our city, and our friendship. The next day we went to Peter and Paul Fortress, saw a very interesting exhibition of sand sculptures and that evening, I met our Kaa-Khem guest from Italy. It was not an easy task as he did not know the city and instead of waiting for us at Catherine the Great monument on Nevskiy Avenue, he stopped at Kutuzov monument (Russian general who kicked Napoleon out of Russia). I understand that there are many monuments along Nevskiy, but difference between these two is obvious – Kutuzov is a man and Catherine is a woman. Nobody could understand mind of Italians, but eventually we found Simone! At night I left St.Petersburg by the same train. Of course my friends did not let me go without bottle of the best Russian vodka – “Tsarskaya” (Tsar’s) which we happily finished with Zach in Moscow.